Student - Constructed for durability, provides years of outstanding performance with a minimum of maintenance. Intermediate - Advanced students appreciate the mechanical and acoustic excellence of conservatory instruments. They offer a full, warm tone with extraordinary quality and performance at a very competitive price. Intermediate - Model 400, The Leblanc Model 400 is an intermediate bass clarinet that features a well-balanced range to low Eb and has a beautiful, dark tone quality. Intermediate - Model 41, The Fox Renard Pastic Bassoon. Polypropylene, molded with critical dimensions machine finished. Body Lock. 18% nickel silver keys with nickel plating. 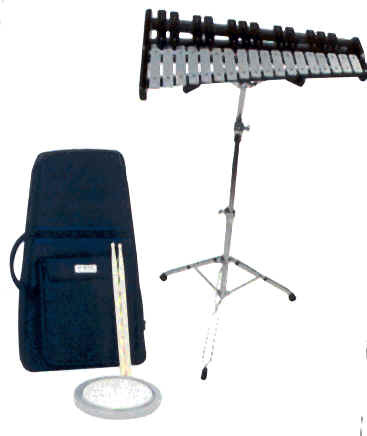 Complete with bag, practice pad, stand, mallets, sticks and music rack. 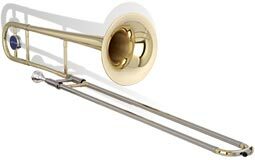 2.5 octaves, G5-C8 bells, 1" wide satin finish aluminum bars. Double pin mounting over neoprene strips. 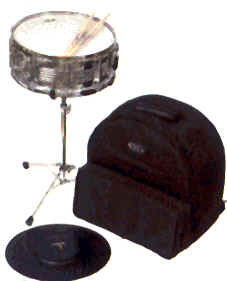 8" tunable practice pad, heavy duty stand. Perfect for beginning student. Intermediate - Model Normandy 4. From Leblanc France, the Normandy 4 is ideal for the beginning clarinet player who prefers a Grenadilla wood instrument. It is extremely free-blowing with a beautiful tone quality, built to the exceptionally high standards of Leblanc professional clarinets. 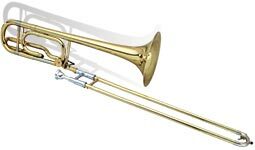 Student - Model 2SP, Plateau model (closed hole); silver-plated headjoint, body, footjoint and keys. Intermediate - Model 3SHB, French model (open hole); solid silver Model “J1” standard wall headjoint; silver-plated body, low B footjoint and keys. Student - Model 300, High quality plastic resin body, hand reamed and finished by Fox craftsmen. Silver plated posts, bands and bell ring. Student - Model 4P, High-impact plastic headjoint and body, conical bore, silver-plated keys and beryllium copper springs. Intermediate - Model 4W, Grenadilla wood headjoint and body, conical bore, silver-plated keys with beryllium copper springs. Intermediate - Model S-901. Yanagisawa’s legendary feather-like keywork smoothness and the comfortable lay of its mechanism make this soprano a pleasure to play for musicians of all ages and abilities. Intermediate - Model A-901. This outstanding alto saxophone contains many of the mechanically superior design features that have made Yanagisawa the leader in the field. Intermediate - Model T-901. This tenor model incorporates many of the innovations that make every Yanagisawa model an incomparably fine instrument. Intermediate - Model B-901. This Yanagisawa intermediate baritone model has features found primarily in professional instruments. Fleet, responsive feel and unique key positioning allow unmatched ease of playing for either large or small hands, resulting in maximum comfort and playing confidence.